At the beginning of the Middle Ages Anglo-Saxons started to develop table manners in old England. 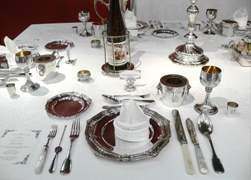 The table setting for a guest consisted of a trencher, a pointed knife and a spoon. 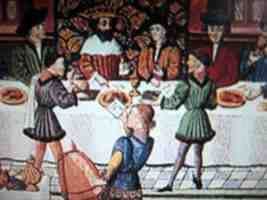 Trenchers were made of hard bread (later of wood) and eaten as part of the meal, given to the poor, or tossed to dogs. 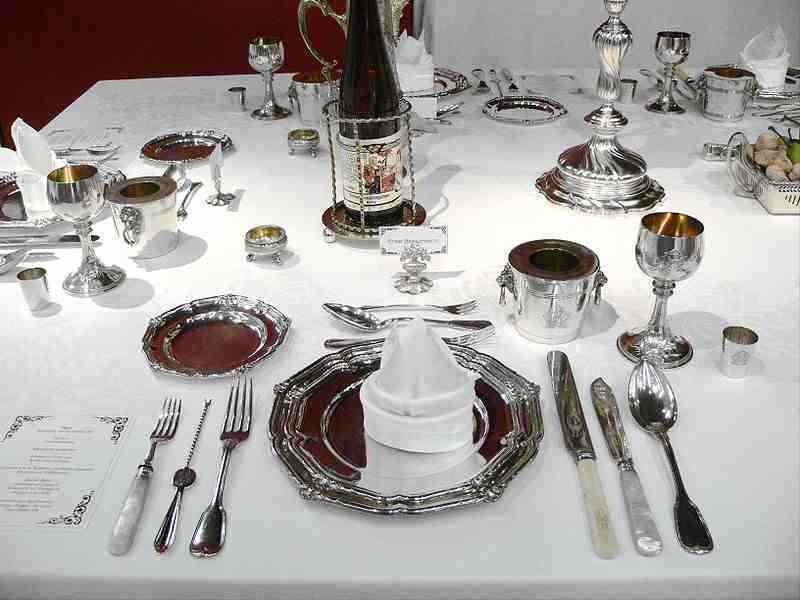 Changing habits and new practices resulted in a rich array of different kinds of hollowware and flatware. 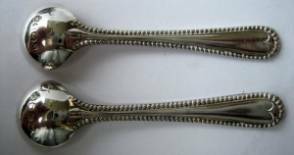 Whereas knife and spoon were already in use, the fork appeared only at the beginning of the 16th century in Italy. 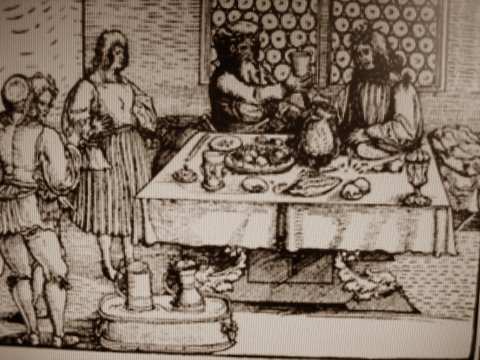 Historically customs related to food and eating were passed on from the upper classes to the lower classes and simplified during the process. During the Medieval period salt was still a rare and important resource and much more valuable than it is today. 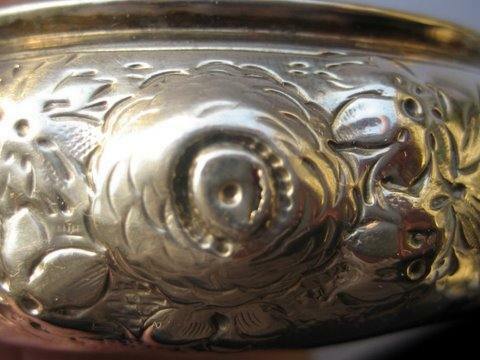 In the early Middle Ages, silver salt cellars were large elaborate pieces, called master salts. 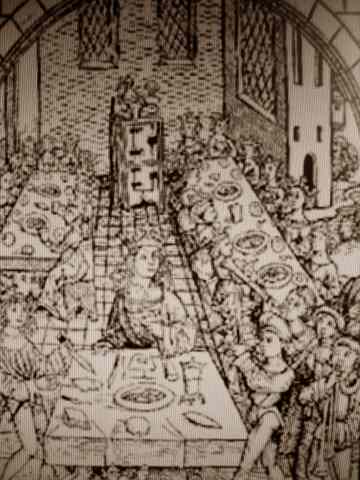 The host sitting at the head of a long table, passed it to his guests, who placed some salt in their individual salt dish (sometimes only a concavity in the trencher) at their setting to sprinkle it on their food. The proximity to the host’s master salt reflected the guest’s importance in rank or honour. 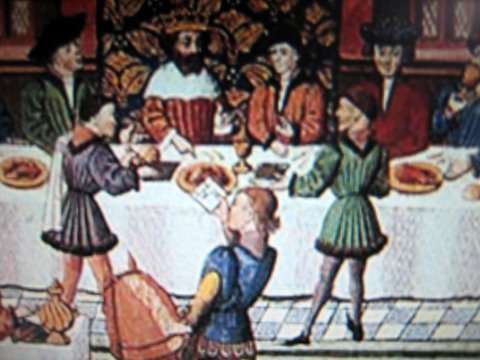 Salt was not offered to the common serfs, hence the expression "above the salt" or "below the salt". 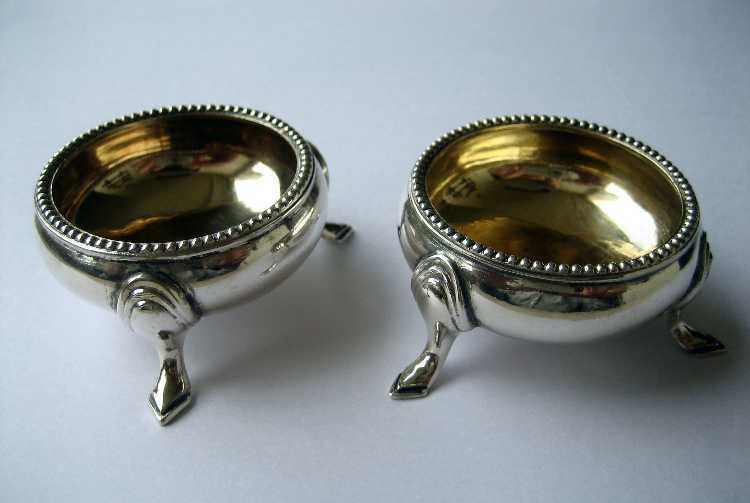 By the early 18th century the typical silver salt cellars appeared (note 1), kept in pairs, answering the dining needs of the growing middle class. The shapes of the salts introduced at that time, cauldron salt, trencher salt, capstan salt and boat shaped salt, remained popular through the 1940's. 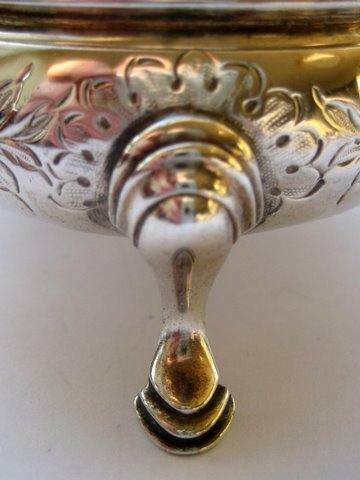 In the mid-18th century most salt cellars had three feet and usually the interior of the salts was gilded to resist corrosion. 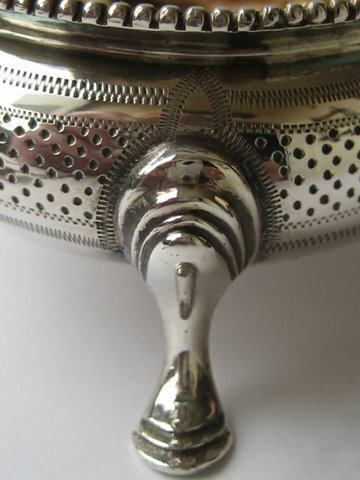 At the beginning of the 20th century it became possible to treat salt with moisture absorbing agents so that ground salt could be sold, which led to the introduction of salt shakers and phasing out of salt cellars. 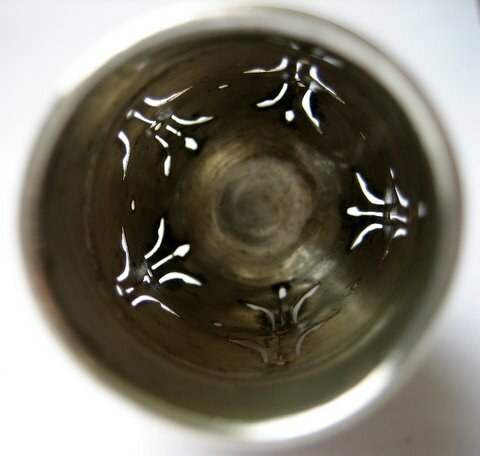 The description of the salt cellars we will deal with clearly illustrates that the cauldron shape remained indeed very popular during several centuries. The decoration, however, evolved with the subsequent styles and changed from plain to sometimes very elaborate decoration. 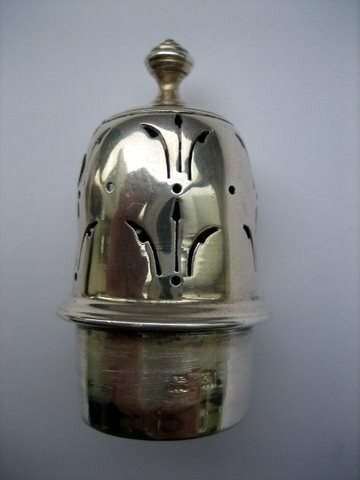 In the mid 18th century a silversmith particularly renowned as being a specialist salt cellar maker was Edward Wood of London. 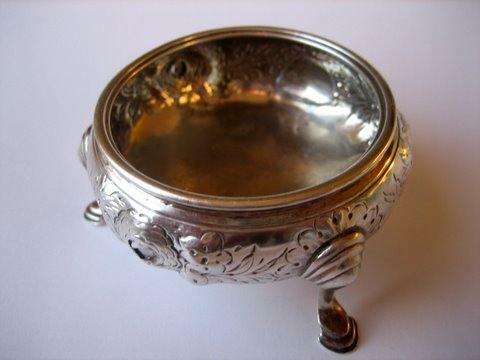 During the reign of Queen Victoria (1837-1901) thousands of salt cellars were produced. 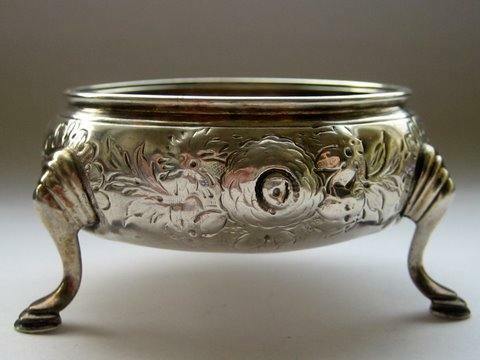 Over-decoration was a characteristic for the Victorian period and it was not uncommon for silversmiths to recycle familiar shapes by adding more elaborate chasing. 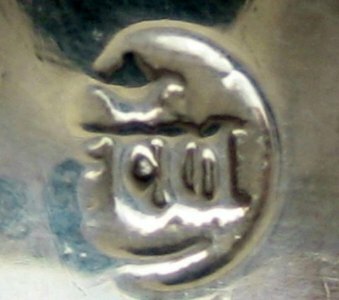 An early Georgian (George II (note 2)) sterling silver, open cauldron salt cellar or open master salt, made in London, England in 1746 by Edward Wood. The round Rococo (note 3) style salt cellar is raised on three hoofed feet with layered shoulders. 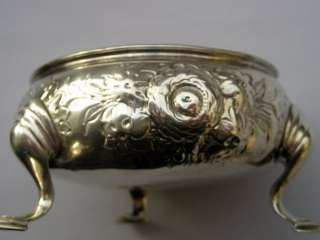 The circumference is embellished with repousse work of roses and leaves. 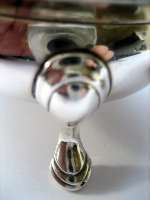 The salt cellar lacks the inner gilding, and a small pinhole, due to over polishing, is present in the center of a rose. It measures 69 mm in diameter, stands 39 mm tall and weighs 52 grams. 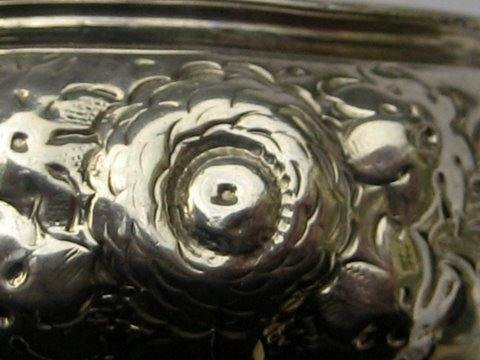 The bottom is hallmarked with the lion passant guardant (note 4) for sterling silver, crowned leopard's head for the Guild mark of London and date letter "l" in old English showing that it was hallmarked in London, 1746. 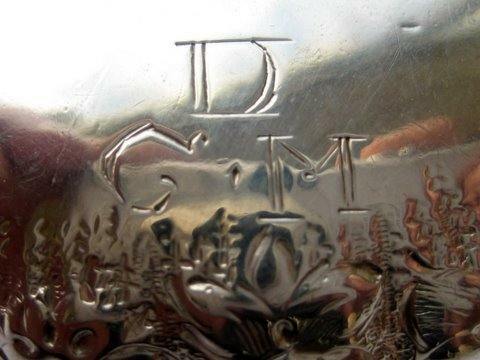 The salt cellar is engraved on the bottom with the initials D over G.M. 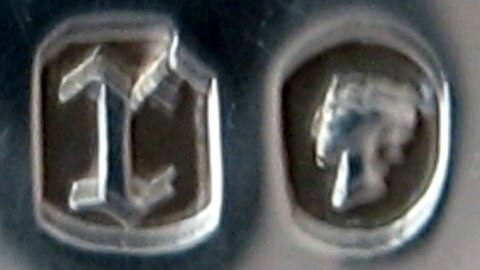 The sponsor’s mark "EW with a crown (note 5) above and a crescent below" punched on the bottom is that of Edward Wood (no relation to Samuel Wood, master to David Hennell). 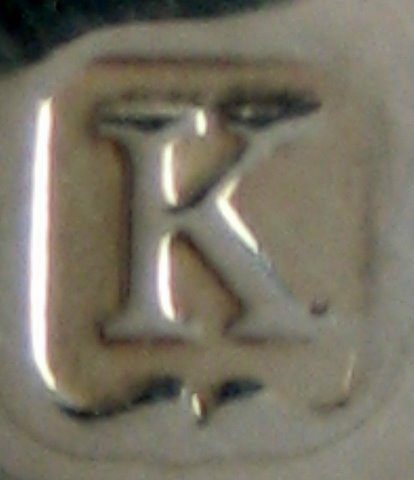 He is registered as being a specialist salt cellar maker. 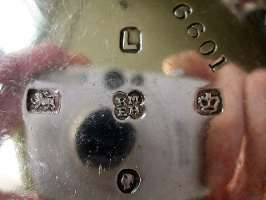 A research paper made about him states "no one in London in the mid 18th century made more salt cellars" (Grimwade, London Goldsmiths 1697-1837: Their marks and Lives, page 709). This mark of Edward Wood was entered in 1740, while an earlier mark was entered in 1722. 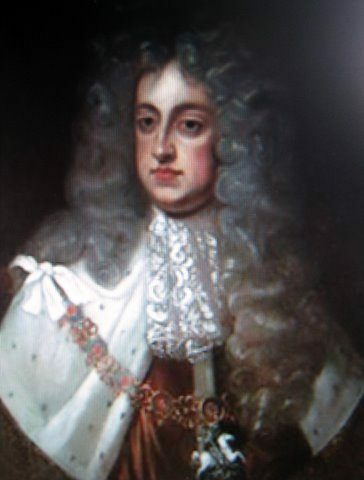 He died 1752. 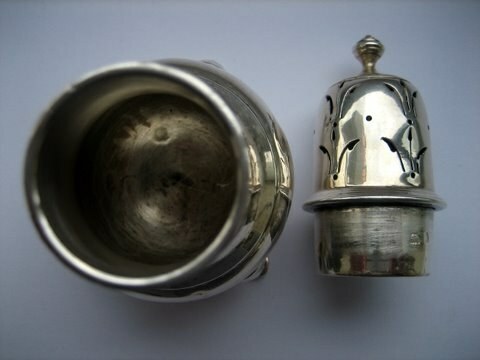 A Georgian (George III (note 6)), sterling silver, open cauldron salt cellar or open master salt, made in London, England in 1774 by the renowned silversmiths Nathaniel Appleton & Ann Smith. Despite the fact that the salt cellar dates to the Neoclassical (note 7) style period it appears that it is executed in the earlier Rococo style (note 8). 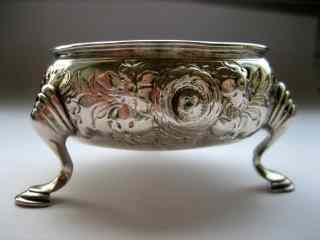 The circumference is embellished with repousse work of roses and leaves. 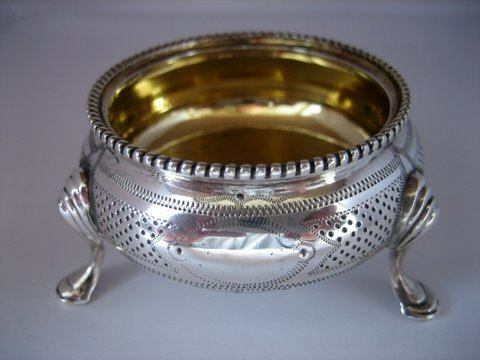 The round salt cellar has a reeded and rolled edge and is raised on three elegant hoofed feet with layered shoulders. It shows no gilding inside. 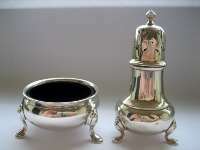 The salt cellar measures 70 mm in diameter, stands 37 mm tall, and weighs 54 grams. 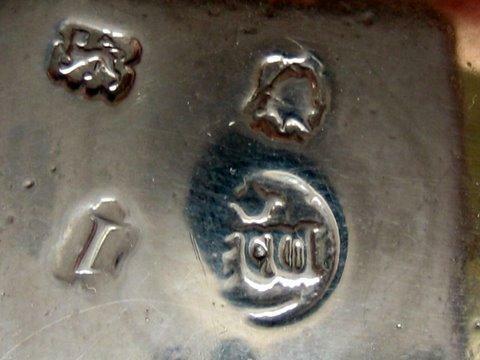 The bottom is hallmarked with the lion passant guardant for sterling silver, crowned leopard's head for the Guild mark of London and the date letter "T" (in old English) showing that it was hallmarked in London in 1774. 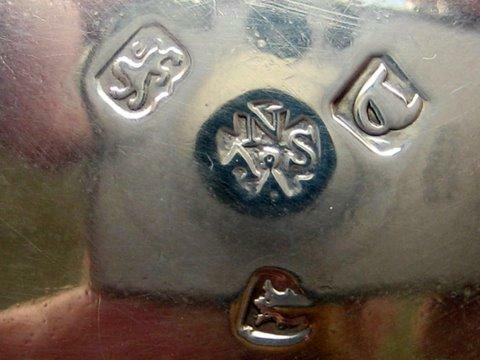 The sponsor’s mark, "N over A.S over A in a cross", (entered 1771) is also punched on the bottom and stands for the silversmiths Nathaniel Appleton & Ann Smith (note 9). 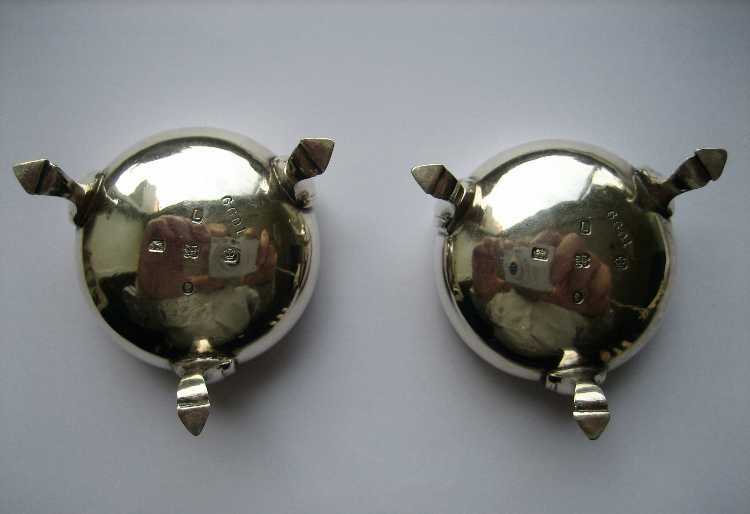 Remark: These salts, of 1746 and 1774, were bought as a pair. 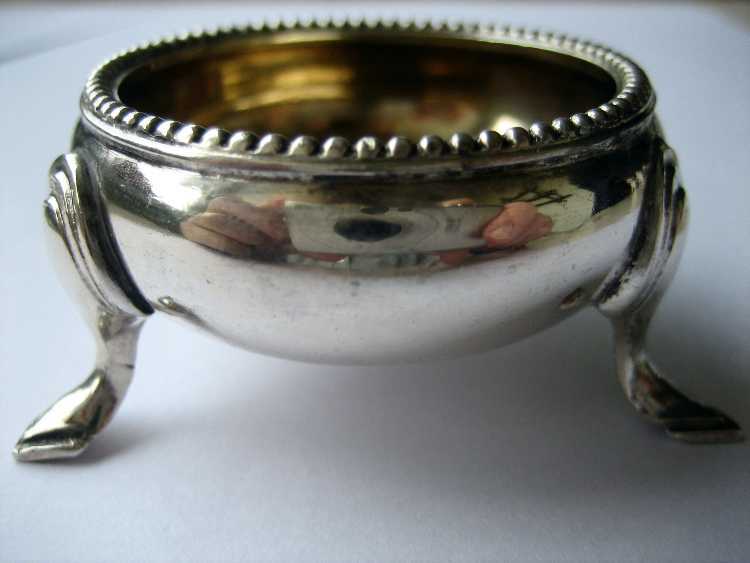 Apparently the original owner ordered the silversmiths Nathaniel Appleton & Ann Smith to copy the design of the salt cellar dating from 1746. 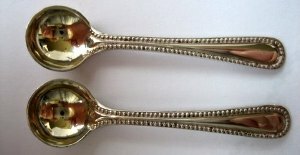 A fine pair of Victorian English, sterling silver, cauldron salt cellars with matching spoons and blue glass liners, made in London, 1872 by silversmith Robert Harper (note 10) in his workshops at 17 Red Lion Street, Clerkenwell. The salt cellars are raised on three hoofed feet with layered shoulders. The body is decorated with engraved dots and lines, three vacant oval cartouches, and a beaded rim. The interior gilding is still in perfect condition. 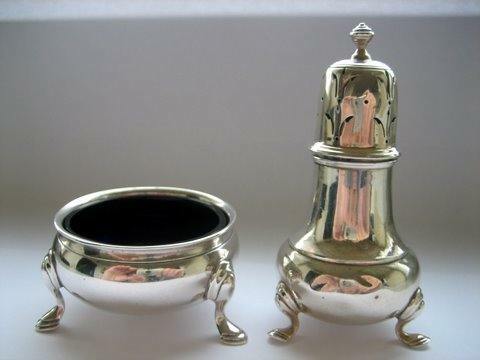 Each salt cellar measures 57 mm in diameter, stands 31 mm tall and weighs 48 grams (69,5 grams liner included). 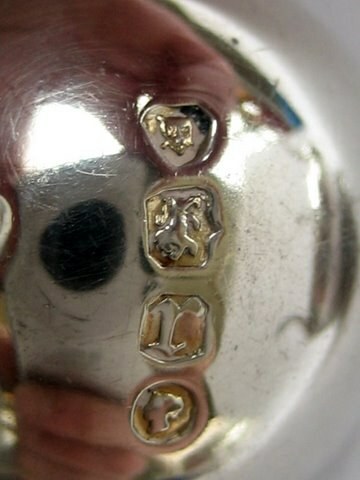 The bottom is fully hallmarked with the lion passant for sterling silver, leopard's head for London Assay Office, date letter "r" for 1872, duty mark "queen's head facing left" and sponsor's mark "RH in two conjoining circles", entered in 1856, standing for silversmith Robert Harper. 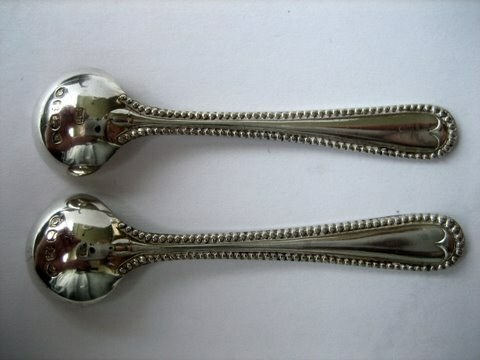 The matching sterling silver salt spoons are decorated with a beaded design running from the end of the stem to the round gilded bowl. 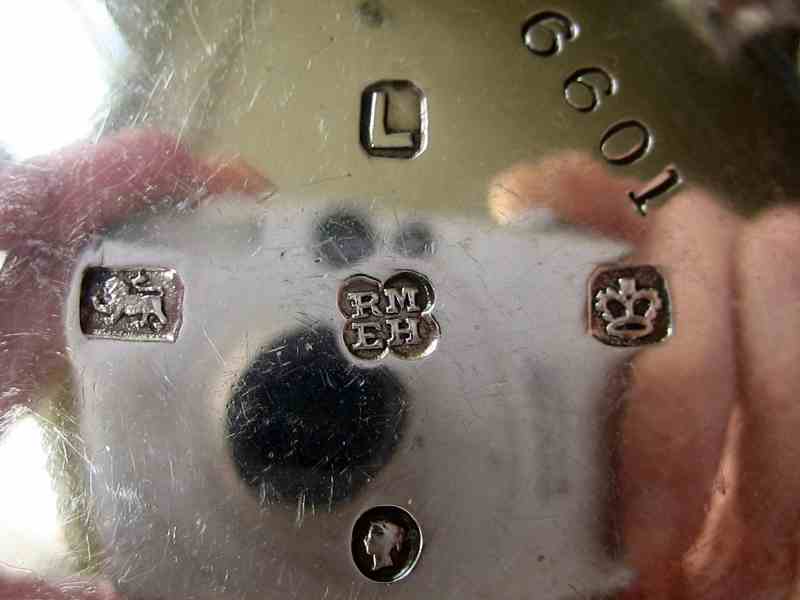 Each is hallmarked on the reverse of the bowl with the lion passant for sterling silver, leopard’s head for London Assay Office, date letter "r" for 1872, duty mark "queen’s head facing left" and sponsor's mark "RH in two conjoining circles" standing for Robert Harper. 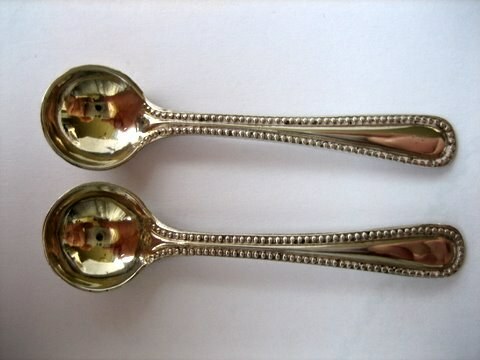 The spoons are 69 mm long and weigh 7,5 grams each. 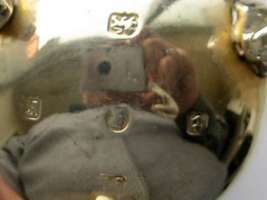 In total the combined silver weight of both salt cellars and spoons is 111 grams. 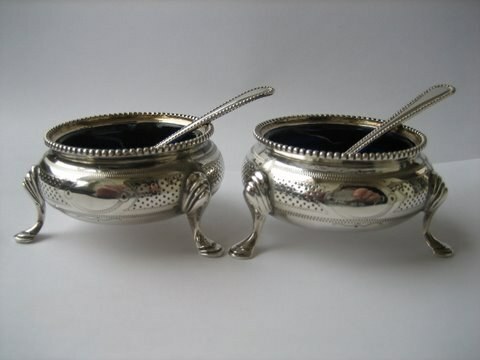 A pair of Victorian sterling silver, cauldron shaped, salt cellars made in Sheffield in 1878 by the well-known manufacturing firm of the silversmiths Richard Martin & Ebenezer Hall of Martin, Hall & Co Ltd. 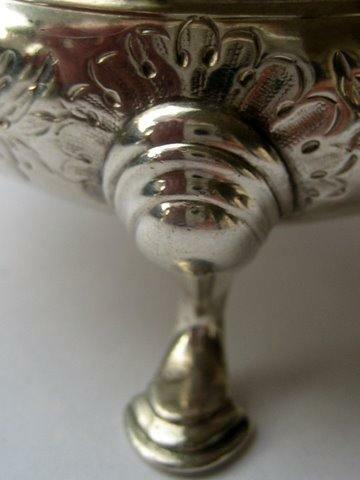 The salt cellars are adorned with a beaded rim and are raised on three hoofed feet with layered shoulders. The interior gilding is still in perfect condition. Each salt cellar weighs 29,5 grams. 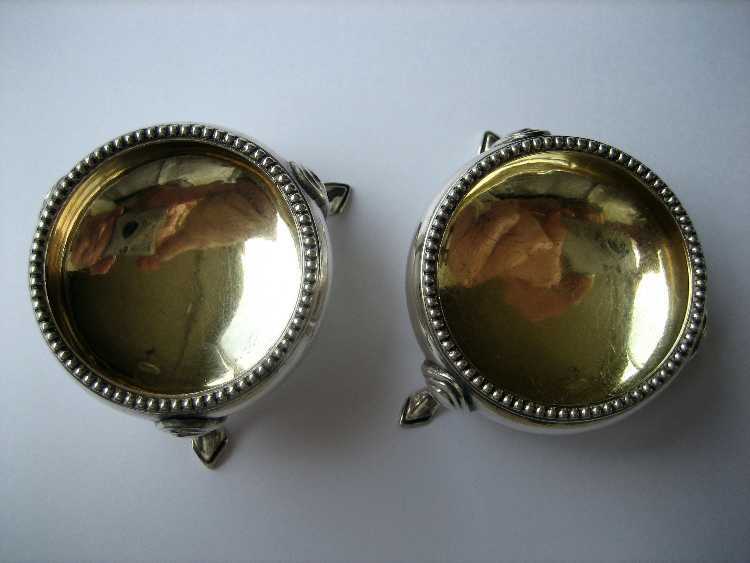 They both stand at 25 mm high and measure 49 mm in diameter. 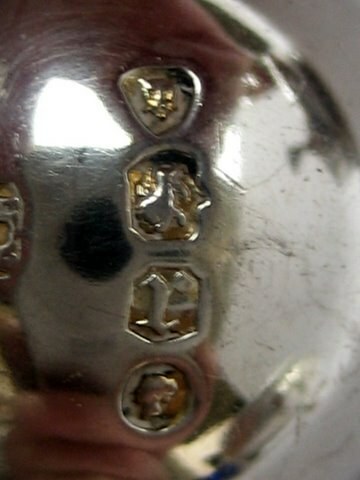 The hallmarks and sponsor’s mark on the bottom are very clear, well struck, and read, lion passant for sterling silver guarantee, crown for Sheffield assay office, date letter "L" for the year 1878, queen's head facing left proving that duty was paid, and the sponsor's mark, "RM over EH in a quatrefoil", standing for Richard Martin & Ebenezer Hall (mark entered June 1863) (note 11). 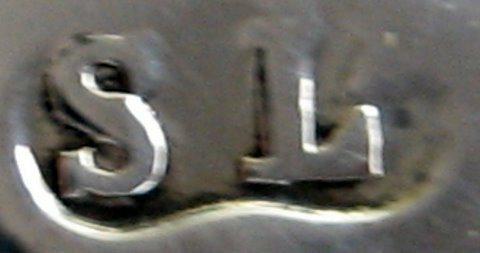 Both salts are punched on the bottom with the number "6601". 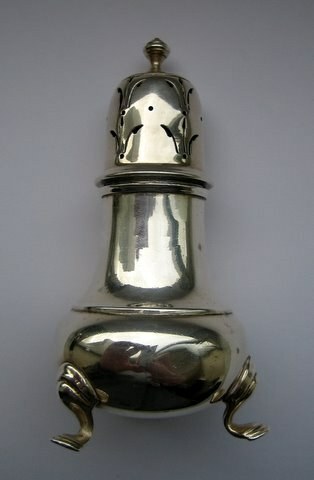 A Georgian style, solid sterling silver cruet set consisting of an open cauldron salt cellar and a pepper pot or pepper caster, made in Birmingham in 1934 by the silversmith S. Lambourne. 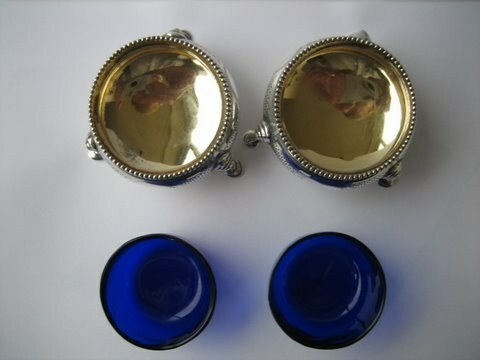 The large, circular, open cauldron salt cellar with its original cobalt blue glass liner has a plain smooth shape, a bowed rim and is raised on three shell capped hoofed feet. 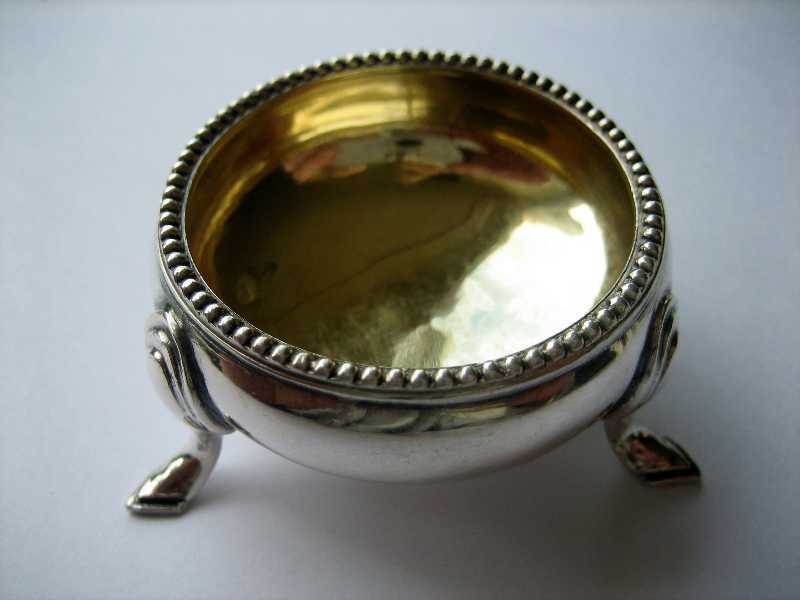 The salt cellar measures 62 mm in diameter, stands 37,5 mm tall and weighs 60 grams (94 grams including liner). 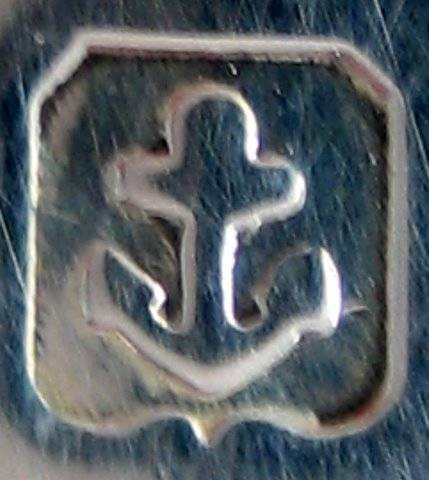 The bottom is fully hallmarked in a group as assayed at the Birmingham office with the anchor and date letter "K" for 1934. 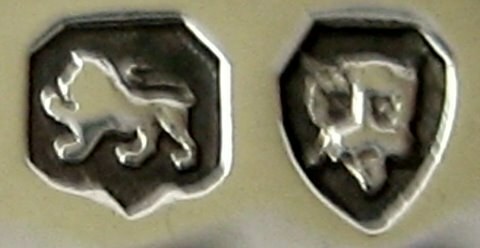 The lion passant mark proves it is sterling silver. 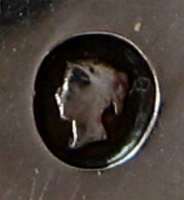 In the center, an optional commemorative "Silver Jubilee mark with the king's and queen's heads facing left"(note 12) is present. 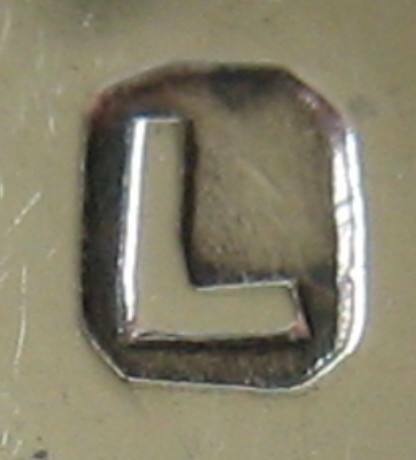 The sponsor’s mark "SL in two conjoining circles" on the bottom is that of S. Lambourne, jeweller at 158 Hockly Park Road, Birmingham. 3 The rococo style was characterized by the emphasis it gave to decoration (floral motifs, masks, shells) and was introduced in France by the architect and goldsmith Juste-Auréle Meissonier around 1720. Its introduction in England dates since 1730 and was completely abandoned in 1765. 8 The rococo style was characterized by the emphasis it gave to decoration (floral motifs, masks, shells) and was introduced in France by the architect and goldsmith Juste-Auréle Meissonier around 1720. Its introduction in England dates since 1730 and was completely abandoned in 1765. 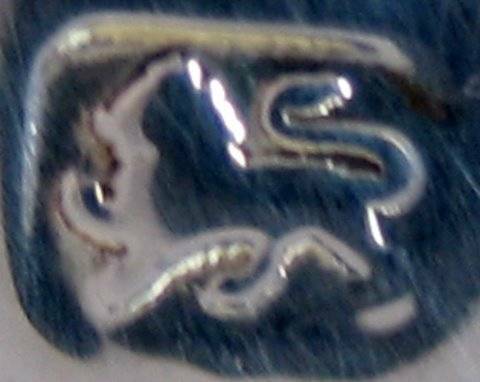 10 This firm of manufacturing silversmiths was established c.1853 by Robert Harper who is first recorded at 10 St. John Street Road, Clerkenwell, before moving on 14 May 1853 to 35 Whiskin Street, Clerkenwell. Then on 4 October 1859 he is recorded at 3 James Street, Goswell Road, EC. Robert Harper is then recorded at 16 (later 17) Red Lion Street, Clerkenwell, EC (9.1.1868-2.8.1883). 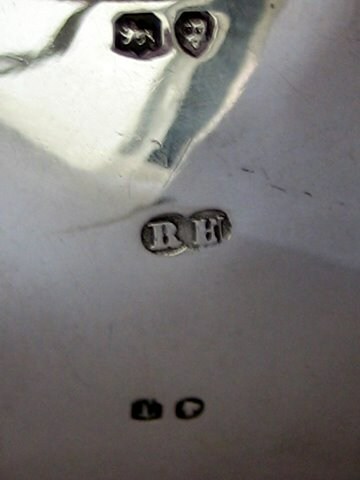 The proprietors, Robert Harper and John Robert Harper, described as manufacturing silversmiths, dissolved their partnership on 1 December 1880. Robert Harper, who still appears to have been a member of the firm, was adjudged bankrupt early in 1883. Afterwards the business continued under the style of Robert Harper & Co represented by John Robert Harper who is recorded on 21 February 1884 at 17 Red Lion Street, Clerkenwell, EC. 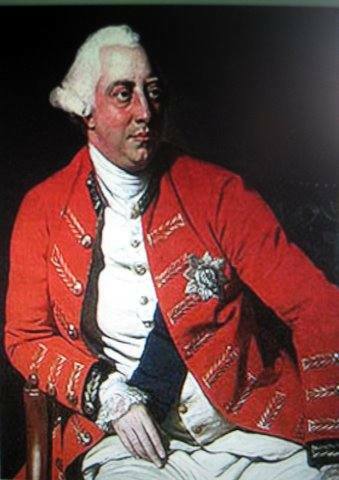 The other partners were Joseph Harper, George Augustus Peacock and Ralph Francis Close. Following John Robert Harper’s retirement on 2 July 1884, Joseph Harper, recorded at the same address, entered the firm’s last mark on 6 January 1885. G.A. Peacock retired on 26 November 1884. Robert Harper & Co is last listed in 1889. 11 Ebenezer Hall started his apprenticeship in 1836 at the silver plater's firm of John Roberts and became partner in 1846, after which the firm was styled Roberts & Hall with a factory at Shrewsbury Works, Broad Street Park, Sheffield and showrooms at Bouverie Street, Fleet Street, London. 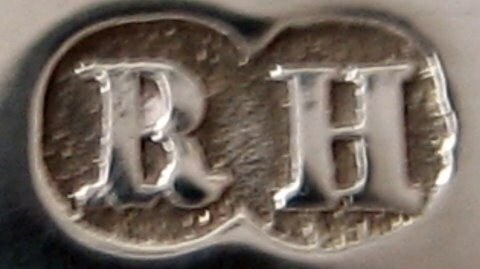 Roberts and Hall were joined in partnership by Richard Martin in 1854 to form the new firm Martin, Hall & Co. John Roberts retired in 1857 and in 1866 the business was converted into a limited liability company under the style of Martin, Hall & Co Ltd with Richard Martin and Ebenezer Hall as the first directors. New branches were opened in Birmingham, Glasgow and Sydney, Australia. Following the first World War, the fortunes of the company began to flag and subsequently went into liquidation and was struck off the register on 16 October 1936. 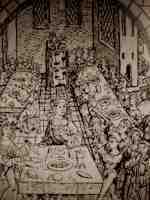 12 Commemoration of the Silver Jubilee of King George V and Queen Mary in 1935. 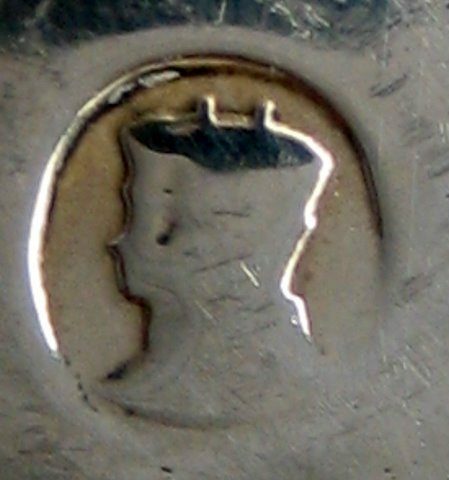 The Silver Jubilee mark was only used during the years 1934 and 1935.